The high-tech community has already contributed two cellphone charging stations on the Greenway. Boston Mayor Martin J. Walsh wants to spruce up Boston’s public spaces and is looking for inspiration from the city’s tech and creative communities. The mayor unveiled the Public Space Invitational Wednesday in the South Boston Innovation District and asked software engineers, designers, artists, architects, and other creative types to jazz up the city’s open spaces with new kinds of street furniture, technology devices, or public art. “It’s a call to designers, artists, and engineers to rethink our streets, our sidewalks, and all of our civic spaces, including improving the experience at City Hall,” Walsh said. Walsh said Boston City Hall and its outdoor plaza, notoriously nicknamed “the brick desert,” are public spaces in need of a major spark. He said a group of young musicians recently performed inside City Hall, bringing new life to the Brutalist concrete complex. It is that type of creativity that the mayor wants to see in the city’s other civic spaces. The ideal is to “capture their intellectual capital” and apply it to public spaces, said Kris Carter of the mayor’s Office of New Urban Mechanics, which is overseeing the public space contest. The mayor’s office will fund as many as six proposals with grants between $1,000 to $4,500 for designers to construct prototypes. Deadline for applications is March 28. One source of inspiration for the public space contest was a new installation by the Rose Fitzgerald Kennedy Greenway: a pair of outdoor seats on the downtown parkway that are equipped with solar panels to power a built-in smartphone charger. Now in storage for the winter, the small seats were created by a team from the Massachusetts Institute of Technology. “A perfect example of what we’re hoping to get out of this,” Carter said of the seats. Philadelphia extended a similar invitation to improve its public spaces last year, offering grants of $2,000 to $7,000 for innovative projects that use public art and design for civic purposes. 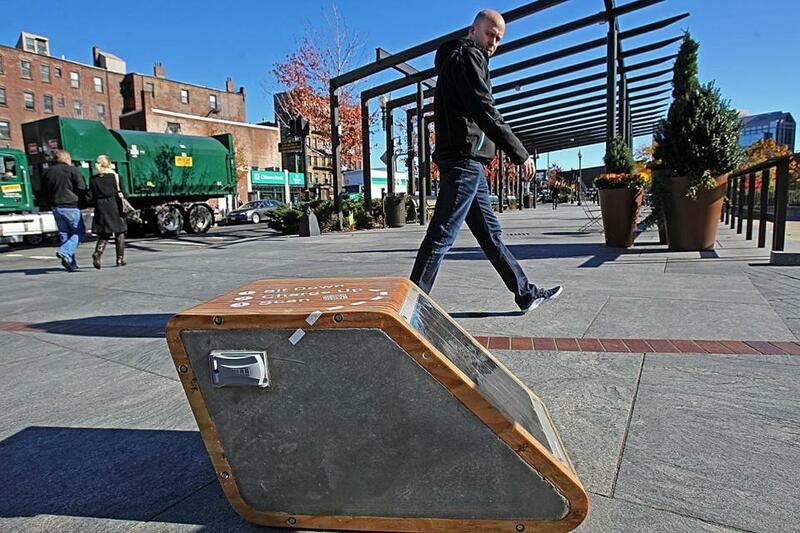 That city is selecting a number of artists-designed bike racks that will be installed in high-traffic public spaces. The winners included such whimsical designs as metal tubing shaped in the outline of a guard dog and blades of carbon steel, shaped and colored to resemble tall tufts of grass, both large enough to lock a bicycle to. Michael B. Farrell can be reached at michael. farrell@globe.com.